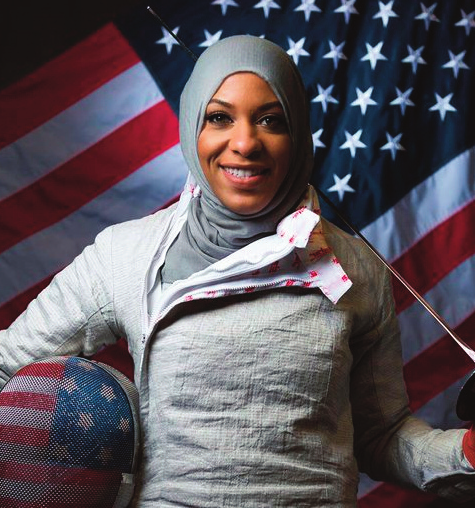 RIO DE JANEIRO -American Ibtihaj Muhammad looked like all the other fencers when she stepped on the piste, save for the non-descript black scarf covering her head. With that small gesture, Muhammad made history. Muhammad became the first American athlete Monday to compete in the Olympicswith a hijab, which she wears to adhere to the tenets of her Muslim faith. Muhammad, ranked eighth in the world in sabre, beat Ukranian Olena Kravatska 15- 13 in her first match before falling to France’s Cecilia Berder 15-12 in the round of 16. Muhammad, a New Jersey native and three-time NCAA All-American from Duke,became an instant star when she qualified for her first Olympics earlier this year. Muhammad embraced the spotlight,which helped make her an unlikely face of theU.S. team given how little publicity fencing typically receives. “It represents who she’s been her entire life.Ever since she was a little girl, she never let anything hold her back. She never set limits. She’s always striving to be the very best,” said Ibtihaj’s brother Qareeb, who was overcome with emotion when he saw his sister compete. Muhammad’s siblings, parents andfriends came from as far away as Los Angeles and New Jersey to cheer her on, giving Muhammad a standing ovation ahead of her first match. But Berder, ranked ninth, took control of their round of 16 match midway through and rolled to victory.Muhammad was so frustrated by her performance that she needed over an hour to compose herself before meeting reporters. “In a sport like fencing, you’re your own biggest opponent. If you can control yourself and your nerves and your emotions and execute the actions that you want to execute in the way that you want to execute,you’ll always be successful. I failed to do that,” Muhammad said. Muhammad’s history-making moment overshadowed the upset loss by teammate Mariel Zagunis in the roundof 16. Zagunis,a two-time Olympic gold medalist ranked third in the world,wasbeatenby Russia’sEkaterina Dyachenko 15- 12. Still,Muhammad and Zagunis are two major reasons why the Americans will be a medal favorite on Saturday. “There is that silver lining in the sense that you do have that team event. I know that theAmericans didn’t perform in the way that we wanted,but I love my team, I love my teammates and I believe in them.Ibelieve in myself.Ibelieve in us, and I want us to win a medal more than anything. I want us to do it for our country,” Muhammad said.